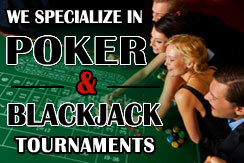 It’s A Deal Casino Rentals is in the business of offering quality entertainment to our clients and their guests. We’re always on the lookout for fun, energetic, reliable and outgoing individuals who enjoy dealing casino games while keeping it fun for both the client and their guests. 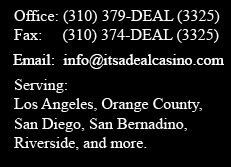 If you live in the Los Angeles or Orange County areas and would like to deal for us, give us a call! We will train you to deal any games we offer. We offer competitive pay and give you a check at the end of the night. Give us a call at (310) 379-3325 – we look forward to hearing from you. More than 50 miles How far are you willing to travel? Other Please tell us the games you deal. More than 10 Years Please give us your years of experience.